Me just 48 hours ago! The group in the waters off the coast of Puerto Morelos. 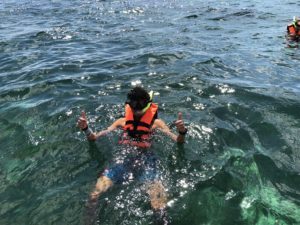 The snorkeling expedition was awesome. There stretched miles of dazzling coral forests and kaleidoscopic marine life. We saw barracudas, garfish, butterfly fish, and a shark! Just like the mangroves, coral reefs provide important ecological functions: they act as a barrier of wave energy during storms, decreasing storm surge flooding, and provide a habitat where underwater creatures can thrive. Our guide Carlos informed us that, as a matter of fact, the health of the mangrove depends on the good health of the coral reef! However, as climate change increases ocean temperatures above of the corals’ optimum growth temperature, pesticides and fertilizers choke the reefs, and oceanic acidification causes corals to produce weaker calcium structures, the coral reefs are in peril of extinction. The 2019 Pantone Color of the Year was announced to be “Living Coral,” a deep shade of pink. Reflecting on my experiences snorkeling along the coral reefs in Puerto Morelos, I can only hope that these beautiful and vital ecosystems will be able to remain “living” and future generations will be able to witness their actual color in real life, rather than just marvel at it in Pantone’s color book. This is Pantone’s selection for the 2019 Color of the Year. Reflecting on my experience as a whole, I can’t help but to think of a quote by Gustave Flaubert: ”Travel makes one modest. You see what a tiny place you occupy in the world.” Going on this trip truly made me realize how big the world really is and how small I am in it. It also made me crave more exploration and adventure into the unknown. One theory suggests that the name “Yucatán” was derived from a Nahuatl (Aztec) word “Yocatlān” meaning a “place of richness” For me, this experience was truly rich. It was rich in scientific knowledge as I learned about the importance of the preservation of biodiversity and culture at Kaxil Kiuic, the importance of mangroves at Río Lagartos, and the effects of climate change on coral reefs in Puerto Morelos. It was rich in new friendships and cultural immersion. It was rich in personal growth and independence. 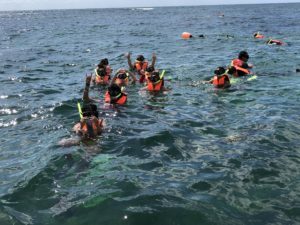 I went on this trip really looking forward to the snorkeling aspect, but what I found more valuable was the wholesome, interdisciplinary education I received. According to a 20-year-long study by Cornell University psychology professor Thomas Gilovich, individuals gain greater satisfaction and happiness from experiences rather than material things. I can personally attest to his findings. This experience was unequivocally “priceless” and the memories I made will forever be indelibly inscribed in my mind. 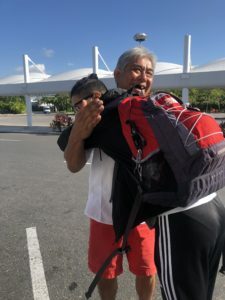 Me giving Carlos our guide un abrazo (hug) before returning home. Jeremy, your description of your study abroad trip is thorough and so well written! Your blog posts are so vividly detailed that I feel like I was learning and experiencing the Yucatán right alongside you 😉🤩 I love you, my boy. ❤️ I’m so happy that you enjoyed this priceless experience and it contributed to your personal growth! Jeremy your article was well written and makes me long for a trip back to Mexico. I especially connected to your statement of we are only a tiny speck compared to the vastness of our world. Humans together make a large imprint on our world and though we are a small part of it our impact on it is enormous. I know you will continue your quest to fight for change on how we treat Mother Earth. Despite your small part in this world I know you will make a great impact on it. Love you to the moon and back! Magnifico Jeremy! How interesting your posts! What an outstanding young man you are! I’ve known you since you were born, and you’ve always been passionate about protecting the environment and learning about other cultures. You are part of a privileged group. I am so proud of you.